A video demonstrates how Netflix employees used the new physical access technology. HID Global announced the completion of two pilots use near field communication to enable employees to physical access without compromising security. The pilots were conducted at the headquarters of Netflix and Good Technology, a provider of secure enterprise mobility solutions, using HID Global’s iCLASS SE platform including iCLASS SEO credentials for use on NFC-enabled smart phones. HID Global’s multiCLASS SE readers replaced proximity readers at selected locations in both the Netflix and Good facilities and pilot participants at each company were given Samsung Galaxy S III handsets. The handsets were equipped with NFC capabilities and HID Global digital keys, so they could securely store and emulate user credentials and open doors by presenting the handsets to the HID Global readers. Netflix has traditionally used keyfobs for access control and wanted to evaluate the provisioning digital keys over-the-air to its staff’s smart phones to streamline the new-employee on-boarding process. The company also believed that digital keys could be a valuable addition to smart phones in its bring-your-own-device (BYOD) mobility environment. By the time the pilot was launched, almost half of the participants were already talking about the mobile access experience by using proximity tags affixed to the back of their current phones to open doors. The pilot was intended to test the concept of a true mobile access experience with over-the-air provisioning capability that also delivered improved user convenience and security. 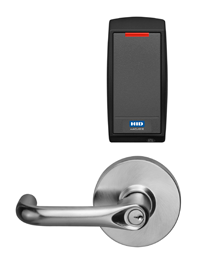 In addition to testing this basic over-the-air mobile access control capability, Good Technology and HID Global extended Good’s mobile access pilot to also evaluate the use of an NFC-enabled SARGENT SE LP10 lock on the door to an executive’s office. When that colleague was away, the office was used as a temporary conference room. The technology enabled the executive to control access to his office – offering it only to select members of his team during specified times – as well as run reports about who was using his office and when. For the pilot Good Technology used HID Secure Identity Services. This enabled users to create secure identities and digital keys for the NFC-enabled handsets using a cloud-based portal and then provision them over-the-air onto their smart phones. More than 80% of Netflix respondents felt that the application for unlocking a door was intuitive, and nearly 90% described it as easy to use. This perception was echoed at Good Technology, where more than 80% of respondents felt the smart phone was more convenient to use than their current access card, primarily because they never forget their phones like they do their badges. All Good Technology respondents said they liked the look of the door unlock application on their phones, and said it was intuitive and easy to use. Approximately 75% of Netflix respondents said they would be willing to load the app onto their own personal smart phone. Roughly 75% at Netflix and 67% at Good Technology said that other people who saw them using their smart phone to access the building asked questions or expressed an interest in it. More than 83% of Good Technology participants said that the company’s physical security was improved by using a smart phone rather than a card to open locked doors. This included respondents who highlighted the benefits of layered security, and being able to use a PIN to unlock their phone and then use the mobile access app to gain entry. Some 87% of Netflix respondents said they would want to use a smart phone to open all locked doors at the company. All Good Technology respondents saw value in additional uses of digital keys on their smart phones, such as logging on to their PC and using their smart phones for secure print authentication, as well as personal uses such as using their smart phones to access their residence and as a mobile wallet for payment. All respondents also said they would like to be able to use their NFC-enabled smart phones to receive digital keys over-the-air that could be used to access a hotel room. Some 81% of Netflix respondents said the fact that the company is testing and deploying mobile access makes it a more fun and exciting place to work.